When users find your business through local search results (SERPs), they’re already one step down the conversion funnel because they’re actively looking for your products or services. Indeed, ranking your business in local search results can often mean the difference between your business stagnating or plateauing, or continuing to grow as it attracts new (and targeted) customers. Of course, while conventional SEO can get pretty complex (and even daunting), Local SEO is often much simpler and more straightforward. In fact, it’s something that SMBs can leverage with little-to-no tech savvy (and a willingness to get’er done). And along those lines, here are 5 basic Local SEO tips to help local businesses rank in local search results. The first things you need to know about Local SEO is that you don’t necessarily need a website to rank well in the SERPs. Indeed, if you’ve ever conducted a local search (either from your desktop or your mobile) you’ve probably noticed the 3-Pack. Simply put, the 3-Pack is that first thing that appears in the local SERPs with a map and then three business listings. And you might’ve noticed that eclipses all other local search results, pushing them “below the fold.” So it should be a goal of any local business to appear in that 3-Pack for relevant search terms. This, of course, begs the question: how do you get your business in there? Well, the first thing you need to know is that those business listings below the map are generated by Google My Business profiles. So the first thing you’re going to need to do is either set-up or claim yours (or one for each of your locations). Once that’s done, you’ll want to make sure that you add all of your business’s information (pic, description, hours, phone number, etc.). The important thing to remember, here, though is the whole “keyword relevance” aspect. That is, when filling out your business name and description, you include the product/service keywords that are most relevant. For example, if the business is an Asian fusion restaurant, but you’re really know for your ramen (or want to rank for ramen in-and-around your location), make sure that the word “ramen” appears in your business name and description (see screenshot above). Finally, and here’s the tricky part, Google decides which 3 local businesses to feature based on the number of reviews they have. 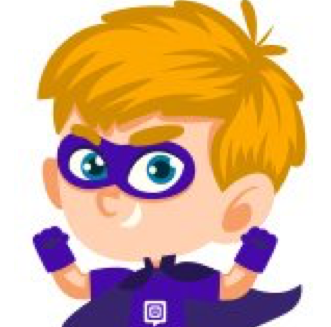 So if your profile is brand-spanking-new, and you don’t have any reviews yet, you’ll want to find ways to encourage your satisfied customers to leave you a review. Just as Google My Business drive the local 3-Pack, Yelp is also an important part of Local SEO. For starters, a properly optimized Yelp Profile can help capture additional real-estate in the SERPs (below 3-Pack, of course). 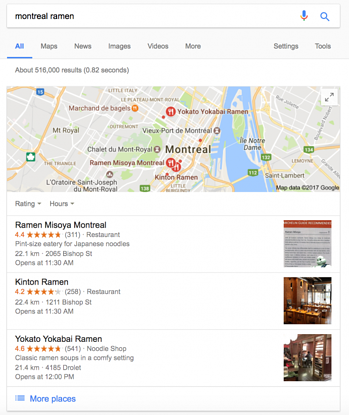 More importantly, however, Yelp is pretty much a top-tier local search engine in and of itself, capable of driving a considerable amount of foot traffic from targeted, pre-qualified customers. So this, too, begs the question: how do you optimize your business’s Yelp profile? Well, it’s actually pretty straightforward. First off, you have to claim or set-up your Yelp profile. Secondly, you have to add all of your business’s information (pictures, description, hours, phone number, etc. ), making sure to include the same relevant keywords. Lastly, you have to solicit reviews or wait for them to roll in (which is important for either showing up in Yelp results or having Google feature your Yelp profile in the SERPs below the 3-Pack). While you don’t need a website to rank in the local SERPs, having one certainly helps. Indeed, it’s one more asset that can occupy an additional spot in the SERPs. So if you have a website for you local business, the first thing you want to do is to make sure that you have a geo-targeted landing page. What does this mean? Well, it depends. If you have just the one location, your homepage and contact page will pretty much serve this purpose. However, if you have multiple locations, rather than lumping them together on one page, you’ll want to create individual, dedicated to each location (more on this below). So you know those blue links you click on in Google SERPs? Well, those are generated by a page’s “Title Tag,” and Title Tags are search engines’ first touch point for what keywords are relevant to a page. So you want to make sure that your site’s Title Tags include keywords that are relevant to both (1) your products/services, and (2) your location. Of course, there’s a catch, and that catch is that Google only indexes the first 50-60 characters, so you want to make sure that in those 50-60 characters you include your business name + your product/service keyword + your location. More importantly, you want to make sure that your geo-targeted landing pages (whether you have a single location or multiple ones) have Title Tags that are optimized along these lines. So now that you have (1) geo-targeted landing pages, and (2) those pages have optimize Title Tags, there are some things you want to have on the page(s) itself to help drive home its relevance to your business’s location. Part of those things include some content (i.e. a brief description of your business or franchise and its services), a map, a picture or two, and an address of the location itself. When it comes to the address, though, that’s where the magic happens. First, Google (and other search engines) like to see an actual address so they can verify you’re an actual business with an actual brick-and-mortar presence. More importantly, however, having an address allows you to mark it up for structured data, Now, I know, this sounds techy, and complicated, and obtuse, but it’s really not. Rather, it’s just a simple HTML tag you can wrap your address and phone number in to say to search engines “Hey, this is not just random content, but our actual coordinates.” Doing so will not only let search engine know that that piece of content is your address (or the address of one of your locations), but help them draw a correlation between your business and localized searches. The biggest challenge to growing any business, is to acquire new customers and then retain them. Of course, if new customers are targeted and pre-qualified, the only thing standing between your business and retaining them is their level of customer satisfaction. And while search engines certainly can’t help with that, they can help your business with reaching potential customers that are targeted and pre-qualified. Fortunately, for local businesses, leveraging search engine traffic (that leads to foot traffic) is a lot simpler than it is for non-local businesses. Most local businesses don’t even need a website to compete in the SERPs; rather, they just need a presence on Google My Business and Yelp, and then to generate some user-generated reviews. And if they really want to step-up their Local SEO game, a couple minor tweak to their existing site will mostly do.